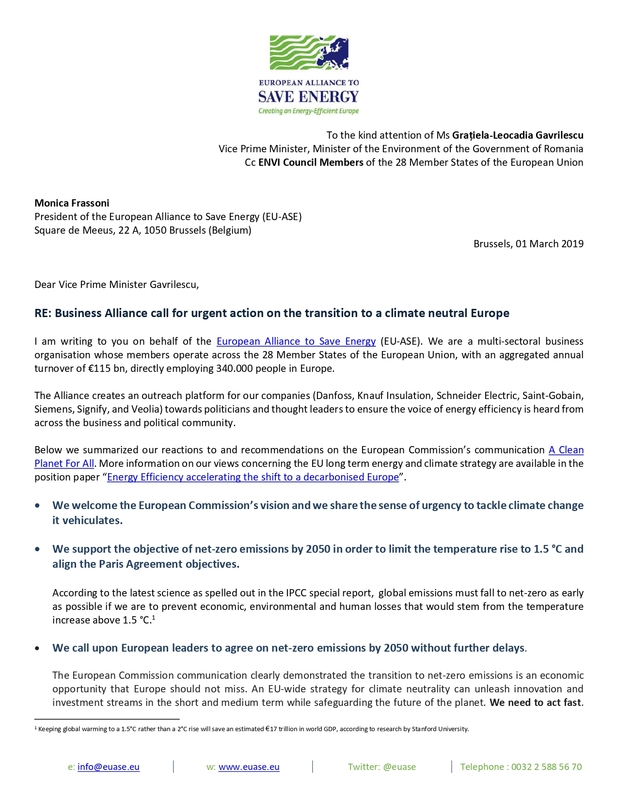 I am writing to you on behalf of the European Alliance to Save Energy (EU-ASE). EU-ASE is a multi-sectoral business organisation whose members operate across the 28 Member States of the European Union, with an aggregated annual turnover of €115 bn, directly employing 340.000 people in Europe. The post 2020 Multi Annual Financial Framework (MFF) is a unique opportunity for the EU to demonstrate coherence with its long-term energy and climate objectives and show commitment to deliver tangible benefits to European citizens. For the businesses community, the post 2020 MFF, including InvestEU, ERDF/CF and CPR Regulations, is a necessary trigger for outlining the much-needed long term political direction for mobilizing private investments towards a decarbonized European economy. InvestEU, ERDF/CF and CPR Regulations must give the right political signal to stimulate investments in clean technologies, and in particular in cost-efficient energy efficiency projects, which will only get unlocked if the EU provides clear direction and long term certainty to the private sector. The impact that Regulations such as InvestEU, ERDF/CF and CPR can have in terms of employment creation, mainly youth employment, is also significant. In order to implement a sustainable energy transition, there will be a large additional demand for workers with different types and levels of qualifications, ranging from lower skilled workforce to highly skilled professionals. This is an opportunity that should not be missed, especially for regions that are suffering from high rates of unemployment, and those that will have to go through a challenging transition pathway. According to the European Commission reflection paper on the 2030 vision, in Europe there are currently nearly 1.5 million jobs in renewables and energy efficiency. Industries operating in the area of building refurbishment represent more than 3.4 million jobs and the Commission impact assessment for the Clean Energy Package stated that there is a potential to create an additional 900.000 jobs by 2030, provided that public and private investments are sufficiently mobilised. Of these, up to 400.000 additional local jobs could come from the energy efficiency sector. The scale of the challenge posed by climate change and its devastating impact on the economy, society and the environment requires substantial public resources to mobilize the necessary private investments. We welcome the sustainability proofing mechanism introduced by the European Parliament and the strong language on the need to orient investments to reach climate goals. We do not support fossil fuel exceptions (ref. Annex V) that would allow technological lock-in and short-sighted investments in new gas and coal infrastructures. InvestEU should instead mobilise investments in energy efficiency improvements to unleash the multiple and collective benefits of energy efficiency in areas with high potential such as buildings. In the current Partial General Agreement of the Council, energy efficiency is only mentioned in recital and annexes. This means overlooking the energy efficiency potential across all sectors and its multiple benefits for citizens, businesses and the environment as a whole. Without stepping-up investment to first reduce energy consumption and only then generating the remaining energy demand from renewable sources, it will not be possible to achieve climate neutrality by 2050, while avoiding significant misallocation of resources. Such increase is necessary taking into account the magnitude of the climate change challenge and the level of support required to achieve climate neutrality by 2050. To prioritize energy efficiency investments, ERDF and Cohesion Fund Regulation should fully apply the Energy First principle and therefore embed the principle to first assess the economic opportunity to reduce energy consumption through cost effective energy efficiency solutions before investing in new sustainable supply capacities. In our view, all investment decisions in the field of energy and climate change must be guided by long term decarbonisation objectives. Faced with the challenge of scarcity, public resources should be spent in the most intelligent, efficient and effective way, paying due attention to aspects such as just transition, and prioritizing areas with the highest economic, societal and environmental value. It does not make economic and environmental sense to invest in new fossil fuels infrastructures like allowed by the exceptions foreseen by Art.6 as proposed by the rapporteur. We should avoid at all cost misusing public resources. Investing in new fossil fuels-based facilities would lock-in investments in technologies of the past for decades and lead to the creation of stranded assets. Instead, we need to invest in the future efficient energy system which will bring multiple economic, environmental and social benefits. 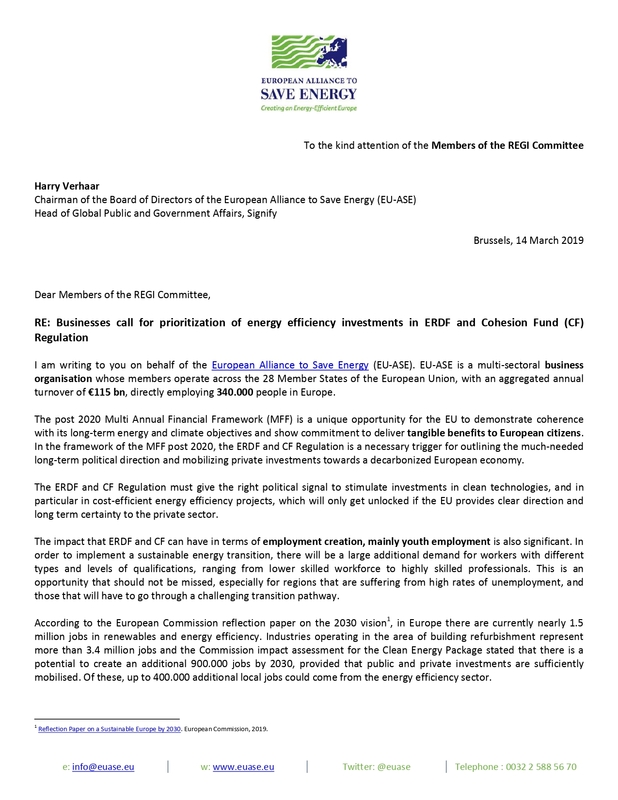 Those plans are set to outline Member States’ strategies and the necessary financial and regulatory means to implement the new energy framework for 2030 and unlock the growth and job potential of crucial directives it contains. For example, in the building sector, ERDF and CF should be used only for energy efficiency improvements that go beyond the minimum energy performance requirements for buildings in line with the revised EPBD and with technological innovations available on the market. The Council proposal for an “assessment of the expected impact on climate change of investments in infrastructure with an expected lifespan of at least five years” is not enough. Only a full application of the Energy Efficiency First principle in energy planning, policy and investment decisions, would allow a meaningful prioritisation of measures that make the demand and supply of energy more efficient and can help transitioning our economy towards climate neutrality by 2050. 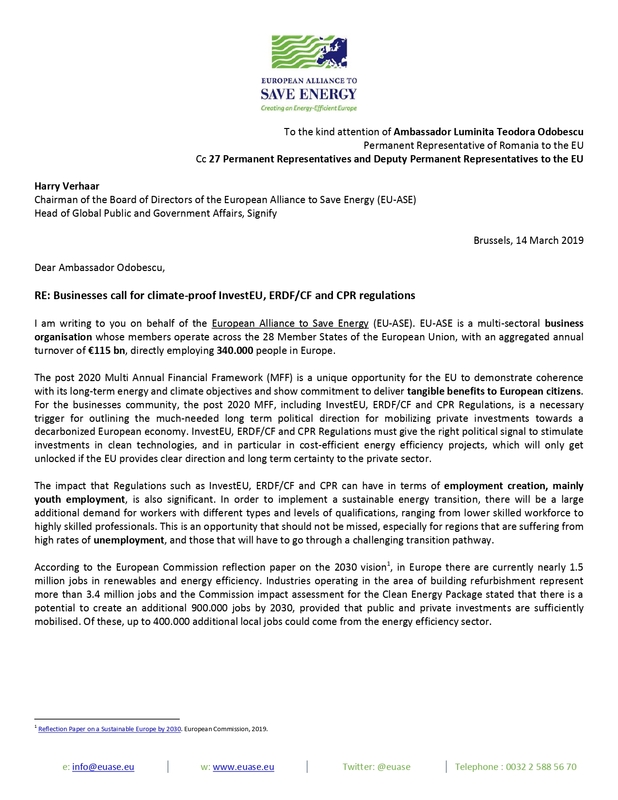 Dear ambassador Odobescu, in view of the current and future trilogues negotiations on these important files, we want to share our common understanding that there is a window of political and economic opportunities to support a climate-proof InvestEU, ERDF/CF and CPR regulations. You and your colleagues have an opportunity to build the foundation of a smarter, climate neutral, energy and resource efficient European society for the good of European citizens and businesses. We remain at your disposal for further discussion on this strategic topic. Reflection Paper on a Sustainable Europe by 2030. European Commission, 2019. I am writing to you on behalf of the European Alliance to Save Energy (EU-ASE). EU-ASE is a multi-sectorial business organisation whose members operate across the 28 Member States of the European Union, with an aggregated annual turnover of €115 bn, directly employing 340.000 people in Europe. The post 2020 Multi Annual Financial Framework (MFF) is a unique opportunity for the EU to demonstrate coherence with its long-term energy and climate objectives and show commitment to deliver tangible benefits to European citizens. In the framework of the MFF post-2020, the ERDF and CF Regulation is a necessary trigger for outlining the much-needed long-term political direction and mobilizing private investments towards a decarbonized European economy. The ERDF and CF Regulation must give the right political signal to stimulate investments in clean technologies, and in particular in cost-efficient energy efficiency projects, which will only get unlocked if the EU provides clear direction and long term certainty to the private sector. The impact that ERDF and CF can have in terms of employment creation, mainly youth employment is also significant. In order to implement a sustainable energy transition, there will be a large additional demand for workers with different types and levels of qualifications, ranging from lower skilled workforce to highly skilled professionals. This is an opportunity that should not be missed, especially for regions that are suffering from high rates of unemployment, and those that will have to go through a challenging transition pathway. To prioritize energy efficiency investments, ERDF and CF Regulation should fully apply the Energy Efficiency First principle and therefore embed the principle to first assess the economic opportunity to reduce energy consumption through cost effective energy efficiency solutions before investing in new sustainable supply capacities. In our view, all investment decisions in the field of energy and climate change must be guided by long term decarbonisation objectives. Faced with the challenge of scarcity, public resources should be spent in the most intelligent, efficient and effective way, paying due attention to aspects such as just transition, and prioritizing areas with the highest economic, societal and environmental value. It does not make economic and environmental sense to invest in new fossil fuels infrastructures like allowed by the exceptions foreseen by Art.6 as proposed by the rapporteur. We should not misuse public resources. Investing in new fossil fuels-based facilities would lock-in investments in technologies of the past for decades and lead to the creation of stranded assets. Instead, we need to invest in the future efficient energy system which will bring multiple economic, environmental and social benefits. 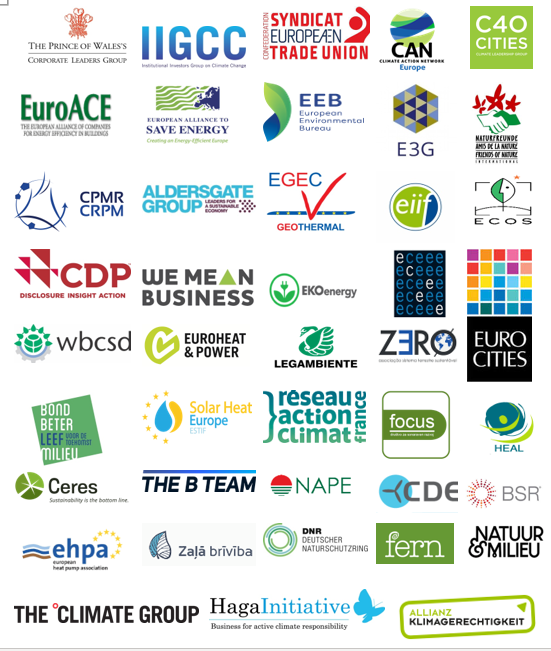 Dear Members, ahead of the vote in Plenary, we urge you to support an ERDF and CF Regulation which envisages a smarter, climate neutral, energy and resource efficient society for the common good of European citizens and businesses. I am writing to you on behalf of the European Alliance to Save Energy (EU-ASE). We are a multi-sectoral business organisation whose members operate across the 28 Member States of the European Union, with an aggregated annual turnover of €115 bn, directly employing 340.000 people in Europe. The Alliance creates an outreach platform for our companies (Danfoss, Knauf Insulation, Schneider Electric, Saint-Gobain, Siemens, Signify, and Veolia) towards politicians and thought leaders to ensure the voice of energy efficiency is heard from across the business and political community. Below we summarized our reactions to and recommendations on the European Commission’s communication A Clean Planet For All. More information on our views concerning the EU long term energy and climate strategy are available in the position paper “Energy Efficiency accelerating the shift to a decarbonised Europe”. We welcome the European Commission’s vision and we share the sense of urgency to tackle climate change it vehiculates. We support the objective of net–zero emissions by 2050 in order to limit the temperature rise to 1.5 °C and align the Paris Agreement objectives. According to the latest science as spelled out in the IPCC special report, global emissions must fall to net-zero as early as possible if we are to prevent economic, environmental and human losses that would stem from the temperature increase above 1.5 °C. We call upon European leaders to agree on net-zero emissions by 2050 without further delays. The European Commission communication clearly demonstrated the transition to net-zero emissions is an economic opportunity that Europe should not miss. An EU-wide strategy for climate neutrality can unleash innovation and investment streams in the short and medium term while safeguarding the future of the planet. We need to act fast. As the Commission has acknowledged the current 2030 targets are not sufficient to be in line with the Paris Agreement objectives. Therefore, in a 2030 perspective, we need to step up those targets to boost our efforts in terms of policies and investments. This way the EU will continue to prove its global leadership in curbing emissions and reinforcing the business, social and environmental case for climate-change mitigation. Integrating the Energy Efficiency First principle in the long-term EU energy and climate strategy becomes even more urgent if we consider that 76% of EU GHG emissions cuts needed to achieve the Paris Agreement objectives can come from energy efficiency improvements, in particular in sectors with high potential. Energy efficiency is by far the most cost-effective way to reduce emissions . Yet, when presenting the cost of energy efficiency in the policy scenarios, the European Commission used in its modelling exercise a high 10% discount rate that made the investments look less attractive, while the discount rates applied by Member States across the EU usually range between of 4 to 5.7%. Lowering the discount rate used for modeling purpose would help to promote investments necessary to halve the energy consumption needs by 2050 (as compared to 2005) as announced by the Commission in the LTS. We believe that Energy Efficiency First should be considered as a basis of the European long term strategy and the main driver of the transformation towards a fossil–free energy system. According to the EU’s Governance of the Energy Union Regulation, “Energy Efficiency First” means assessing the potential of energy efficiency in all decision related to energy use. In practice this is about systematically comparing the added value of energy efficiency measures and carbon-neutral energy supply solutions, taking account of benefits such as job creation, economic growth, energy security, improved air quality, and climate mitigation. The Energy Efficiency First principle boils down to making informed choices to invest taxpayers’ money in cost-effective measures. We need to avoid investments in infrastructures that are incompatible with the net-zero ambition and could thus lead to the creation of stranded assets. We welcome the call for higher buildings’ renovation rates and the recognition of the role that digitalisation and near zero-emissions buildings will play in the transition. While it is well established that buildings sector (both the residential and service sectors) will play a crucial role in the reduction of the final energy consumption, the modelled renovation rates in the LTS are not capturing its full potential. The Communication assumes a timid 1.8% yearly renovation rate, which will not be sufficient to achieve the needed transformation of the building stock – 97% of which is still remaining energy inefficient. We, therefore, urge European leaders to back deep staged renovation of the European building stock and aim to increase the retrofit rate to at least 3% per year. Highly efficient and resilient buildings will also help accelerate the integration of renewables into a flexible and consumer centered energy system. Innovative financing mechanisms are available and together with public resources can help mobilize private investments in areas with high mitigation potential. A just transition, as spelled out during the COP24, will foster sustainable growth through innovation, knowledge transfer and development of new skills, each of these contributing to the prosperity, health and well-being of Europe’s citizens. The process to achieve a climate neutral Europe is an opportunity to design an energy transition path that will benefit citizens, businesses and the environment. The European Alliance to Save Energy wants to be part of that process and accompany stakeholders in the definition of the most adequate and enabling policy framework there is. 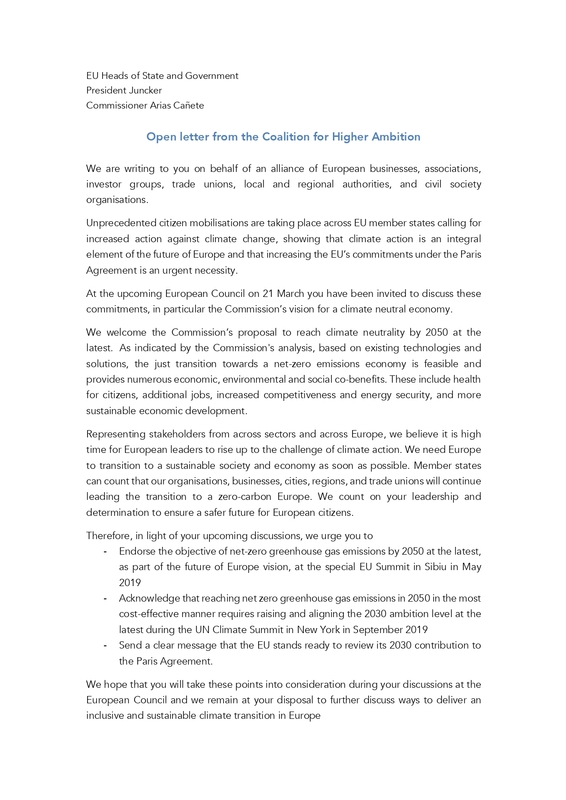 We encourage you and your colleagues, as a political leaders to endorse the Commission’s strategic vision and notably its ambition of EU climate neutrality by 2050 at the latest. We wish you a fruitful meeting and remain at your disposition for further discussion on this strategic topic. We remain at your disposal for further discussion on this important topic. Keeping global warming to a 1.5°C rather than a 2°C rise will save an estimated €17 trillion in world GDP, according to research by Stanford University. We welcome the Council’s ongoing work on the recast of the Drinking Water Directive. The recast of the Drinking Water Directive is a unique opportunity to include a missing dimension in the current water regulatory framework, which is the energy-water nexus. 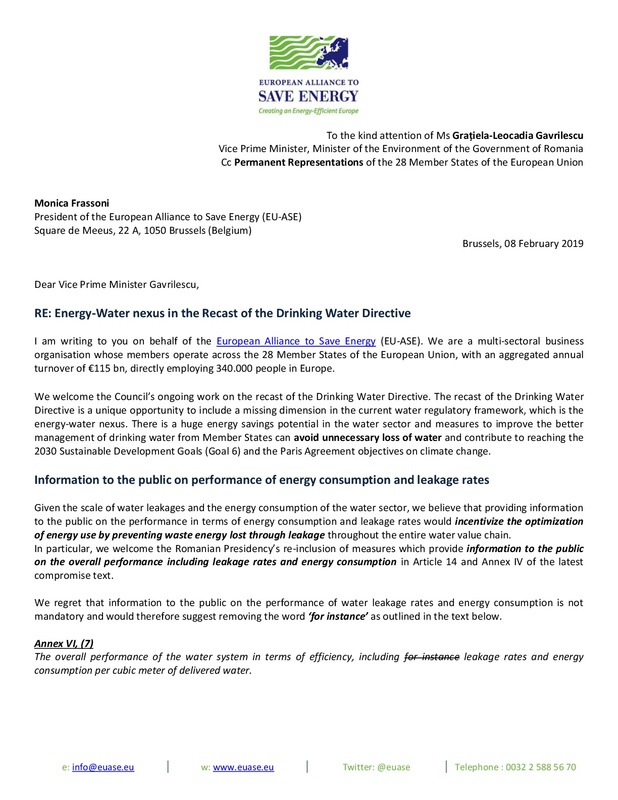 There is a huge energy savings potential in the water sector and measures to improve the better management of drinking water from Member States can avoid unnecessary loss of water and contribute to reaching the 2030 Sustainable Development Goals (Goal 6) and the Paris Agreement objectives on climate change. Given the scale of water leakages and the energy consumption of the water sector, we believe that providing information to the public on the performance in terms of energy consumption and leakage rates would incentivize the optimization of energy use by preventing waste energy lost through leakage throughout the entire water value chain. In particular, we welcome the Romanian Presidency’s re-inclusion of measures which provide information to the public on the overall performance including leakage rates and energy consumption in Article 14 and Annex IV of the latest compromise text. We regret that information to the public on the performance of water leakage rates and energy consumption is not mandatory and would therefore suggest removing the word ‘for instance’ as outlined in the text below. The overall performance of the water system in terms of efficiency, including for instance leakage rates and energy consumption per cubic meter of delivered water. Current leakage rates at EU level are too high. According to the Commission’s impact assessment, 23% of treated water is lost in public water supplies in Member States. This means that 23% of the drinking water for the public must be treated again to enable access to clean drinking water for human consumption, adding to the high energy consuming profile of the drinking water sector. As example, one leak of 8,3 mm has emission of 3454 kg CO2 eq/a or equivalent to 75% of a car running all year. In Brussels, based on this calculation and on the assumption of real water losses of about 23%, water leakage produces a total volume of drinking water lost per year of 11,1 Million m3/a which determines 634,4 Mtoe/a CO2-emissions equivalent to the emissions of 138 cars running non-stop for the whole year. In light of the above, we would like to underline that more ambitious measures are needed in order to effectively tackle the scale of Europe’s water leakage problem. We would recommend reinserting the Recital 21 – including mandatory Member State action plans to be developed in order to deal with the growing issue of water scarcity – and consider that investments are needed to incentivize Member States to upgrade their water infrastructure in order to better adapt to climate change and water stress. As such, for Recital 21, we suggest to consider the text outlined below. Recital 21: The principles to be considered in the setting of water tariffs, namely recovery of costs for water services and polluter pays, are set out in Directive 2000/60/EC. However, the financial sustainability of the provision of water services is not always ensured, sometimes leading to under-investment in the maintenance of water infrastructure. With the improvement of monitoring techniques, leakage rates – mainly due to such under-investment – have become increasingly apparent and reduction of water losses should be encouraged at Union level to improve the efficiency of water infrastructure. In line with the principle of subsidiarity, that issue should be addressed by increasing transparency and consumer information on leakage rates and energy efficiency. Furthermore, Member States should be recommended to develop action plans that deal with the growing issue of water scarcity, including measures to deal with water leakage. We trust you agree that reducing energy waste in the water sector makes economic and environmental sense as it delivers tangible, multiple and collective benefits to European citizens, households and local authorities. We remain at your disposition for further discussion on this important topic. Energy for disinfecting by UV and distributing the water under 6,9 bars pressure in Brussels: 0,15 kW/m3 or 0,033 kg CO2 equivalent/m3. Considering 23% of water losses in Brussels, we waste 1,77 Giga Watts or 634,4 metric tons of CO2 eq per year, equivalent to 138 cars running non-stop on gas for the whole year (Source: Xylem Inc. based on International Energy Agency: World Energy Outlook 2016, Brussels Environment, Eurostat, US Environemental Protection Agency).